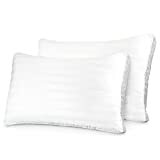 The Beckham Hotel Collection Gusseted Gel Pillows are crafted in super plush gel fiber and expertly tailored to ensure maximum comfort in all sleeping positions! The gusset cover creates extra space for the filling to expand creating a consistent level of comfort no matter what position you sleep in or how much you move in the night. You will feel like you are sleeping on a cloud. They are stylish, luxurious, and extremely comfortable! They are dust mite, mold, and mildew resistant. Plus, they are completely allergen and chemical free. 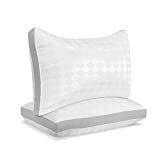 Our pillows are the perfect choice for people who suffer from asthma, allergies, and other respiratory issues.Don’t wait! Purchase your own Beckham Hotel Collection Gusseted Gel Pillows NOW!